View this sample resume for a legal assistant, or download the legal assistant resume template in Word. Can your resume properly defend your skills and experience? To be considered for top legal assistant jobs, resume expert Kim Isaacs says it helps to have a comprehensive resume. 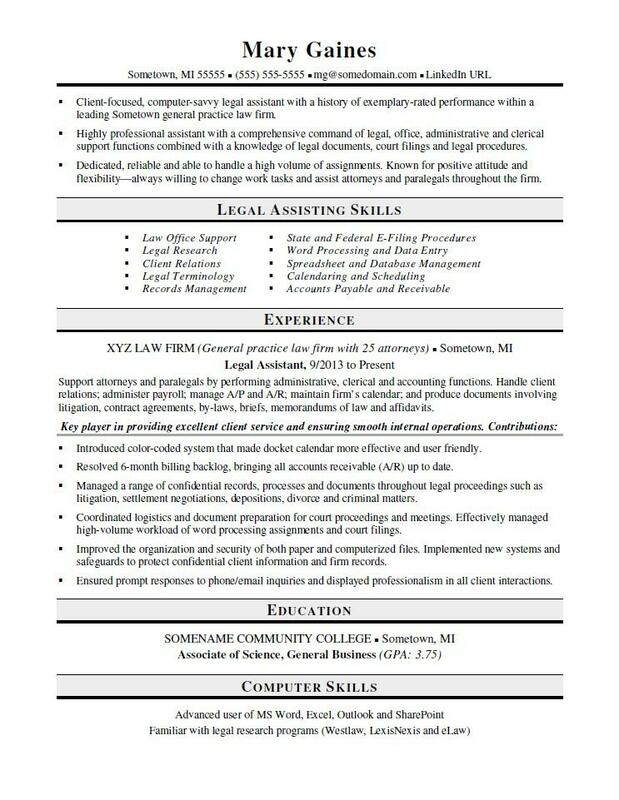 For resume writing tips, view this sample resume for a legal assistant that Isaacs created below, or download the legal assistant resume template in Word. Jobs for legal assistants are projected to grow by 15% (or 41,800 jobs) from 2016 through 2026, which is much faster than average, according to the Bureau of Labor Statistics (BLS). You'll find the highest level of employment for this job in the following states: California, Florida, New York, Texas, and Illinois; and in the following metropolitan areas: New York City, Los Angeles, Chicago, Washington D.C., and Atlanta. As a legal assistant, you can expect to earn a median wage of $50,410 per year, or $24.24 per hour, according to the BLS. Additionally, you can search for legal assistant jobs on Monster. Client-focused, computer-savvy legal assistant with a history of exemplary-rated performance within a leading Sometown general practice law firm. Highly professional assistant with a comprehensive command of legal, office, administrative and clerical support functions combined with a knowledge of legal documents, court filings and legal procedures. Dedicated, reliable and able to handle a high volume of assignments. Known for positive attitude and flexibility—always willing to change work tasks and assist attorneys and paralegals throughout the firm. Support attorneys and paralegals by performing administrative, clerical and accounting functions. Handle client relations; administer payroll; manage A/P and A/R; maintain firm’s calendar; and produce documents involving litigation, contract agreements, by-laws, briefs, memorandums of law and affidavits. Introduced color-coded system that made docket calendar more effective and user friendly. Resolved 6-month billing backlog, bringing all accounts receivable (A/R) up to date. Managed a range of confidential records, processes and documents throughout legal proceedings such as litigation, settlement negotiations, depositions, divorce and criminal matters. Coordinated logistics and document preparation for court proceedings and meetings. Effectively managed high-volume workload of word processing assignments and court filings. Improved the organization and security of both paper and computerized files. Implemented new systems and safeguards to protect confidential client information and firm records. Ensured prompt responses to phone/email inquiries and displayed professionalism in all client interactions. As a legal assistant, you're used to preparing documents, but that likely doesn't include resumes. Could you use some help with that? Get a free resume evaluation today from the experts at Monster's Resume Writing Service. You'll get detailed feedback in two business days, including a review of your resume's appearance and content, and a prediction of a recruiter's first impression. Then you can consider it case closed!